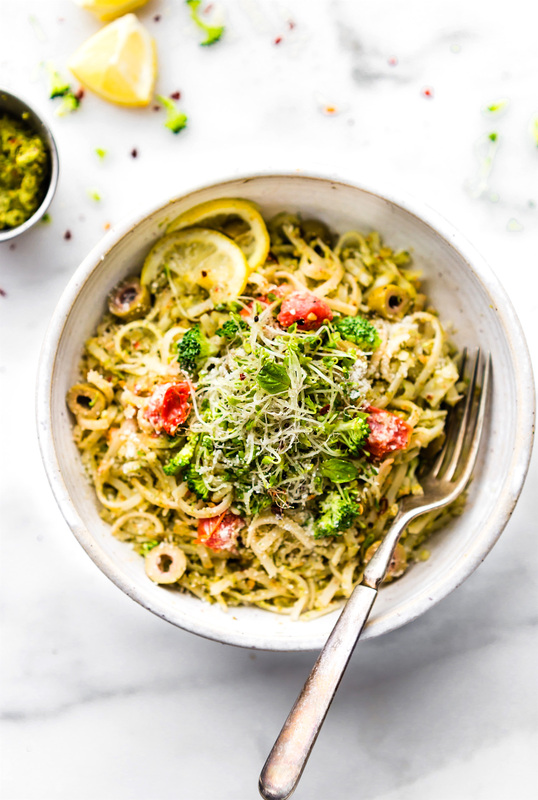 This gluten free Peppery Broccoli Arugula Pesto Pasta is gonna rock your world! 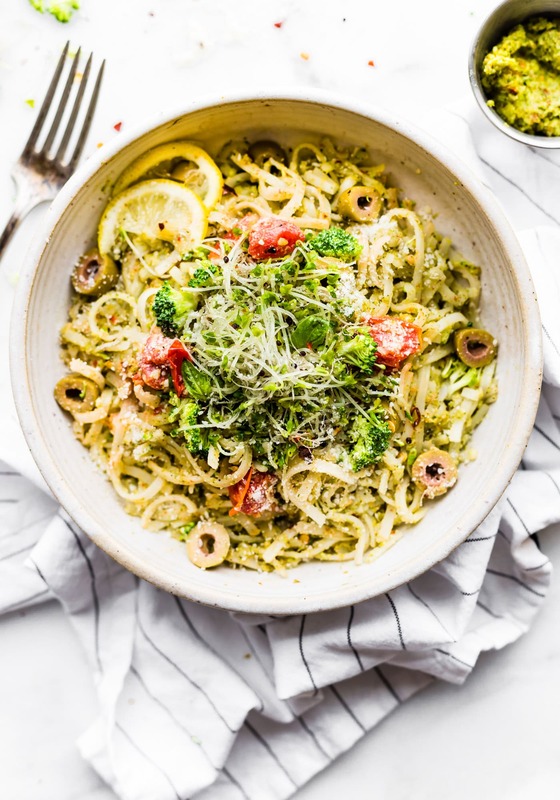 A pesto pasta with broccoli and arugula and packed with nutrition and flavor! An easy pasta dinner for a quick weeknight dinner or healthy lunch! Ready in under 30 minutes and vegan friendly. Can’t beat that now, can you? Okay y’all! Last day of July! What the what?? That being said, it’s time to pep things up for new month. Pep? As in peppery broccoli arugula pesto pasta! Say that 10x fast. Lol! Sorry, I’m sleep deprived and hungry. Which makes me extra corny. Oh yes, we’re talkin peppy pesto! Gah, I am obsessed with making homemade pesto this summer. Can’t stop, won’t stop! 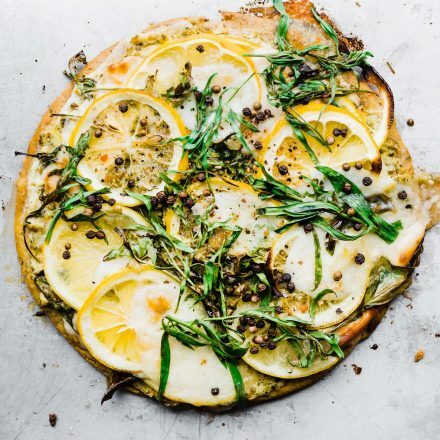 The abundance of leafy greens, summer veggies, and basil has my foodie heart jumping for joy! But you should probably know what makes this summer pesto pasta so peppy! Peppery? It’s that broccoli and rocket! Rocket, as I’m arugula!! Did you know that people in New Zealand and parts of Europe call arugula rocket? I’m sure you did I am the only one that didn’t! Ya, Funny story about that rocket. Anyways, that name for arugula will forever be a funny memory in my heart! Now let’s discuss this rocket arugula broccoli pesto pasta! The American Version. That peppery pep all makes sense now, right? Pep as in rocket power! Peppery Arugula, and one heck of tasty pesto pasta! Made rocket fire fast! See what I did there? Ha! 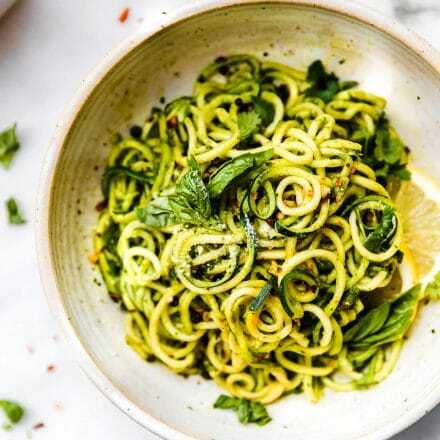 Okay no just toss your pesto in with cooked gluten free rice noodles, a spiralized vegetable noodle, or another gluten free pasta of choice. A handful of cherry tomatoes, marinated olives, and extra broccoli sprouts to top! Here’s my other tip. If you don’t want to actually cook gluten free pasta, use Asian rice noodles! Most of those type of rice noodles/sticks you can just soak in hot water for 30 minutes. Then rinse cold and toss all in a pan super cook with the pesto and tomatoes. Snappy, peppy, peppery, PERFECT! I can’t stop saying that word ya’ll! Pretty sure you will get like 10 servings of vegetables without even knowing it! Plus this plant power pesto pasta bowl actually has a decent amount of protein. WOO! Oh and Vegan friendly and gluten free, of course! I won’t judge for rolling your eyes at my humor. Go for it! But while you’re rolling your eyes, please wipe the drool, cause this dish should have made you super hungry! Mmm k? 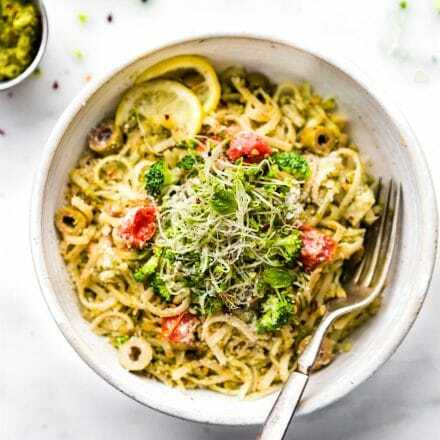 A quick and healthy Broccoli Arugula Pesto Pasta! Gluten free, vegetarian with vegan option. 2 tbsp crushed smoked or roasted almonds to top. Optional topping – grated Parmesan or non dairy cheese topping of choice. First make sure your broccoli stems are cut off. You just want to use the floret part. 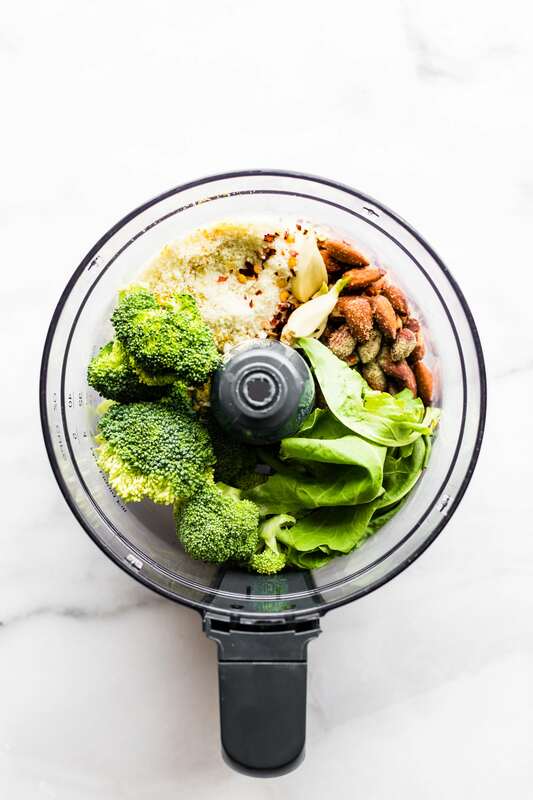 Place broccoli in food processor first, and blend until finely chopped. Add in your almonds, nutritional yeast (or grated parmesan), seasonings, and arugula . Blend and pulse again until all is mixed. Squeeze the lemon evenly around the blended pesto. Close the lid, except for the the top hole, and place food processor on low. Slowly drizzle in oil while food processor is going. Stop and scrape sides if needed. Pulse until smooth. If you want thinner pesto, add more oil or a touch water. Adjust salt/pepper to taste if needed. If you are using the rice noodles, bring a large pot of water to a boil. Add the noodles 2-3 minutes. Be sure not to overcook. Remove noodles from stove. Drain. Rinse in cold water, then add back to pot with 2/3 cup of pesto. NOTE –> If you are using regular gluten free pasta, cook according to package. Usually 6-8 minutes is sufficient for boiling. Rinse in cold water after cooking. Add in handful of tomatoes and any extra seasonings. Mix together on medium until tomatoes are cooked and pesto is mixed through. Serve into bowls and top with broccoli sprouts, sliced olives, crushed almonds, salt/pepper, red pepper flakes, and olives. Drizzle of olive oil if desired. Feel free to add in a protein of choice! Pesto makes around 2 cups. You will only need 2/3 cup or less for this recipe. So keep the rest to spread on toast or add to potato salad! Hit me up! What’s your favorite pesto recipe or pesto pasta recipe? Cheers to a PEPPY week! What an interesting way to make pesto! You are a genius! Okay thank you for this recipe on so many fronts. Thanks for a pesto with out pine nuts and parmesan. Amen. Thanks for using rocket/arugala and not basil and thanks for throwing olives on there. A super awesome summer recipe! Oh wow, this looks incredible. Definitely going on my “must make” list! 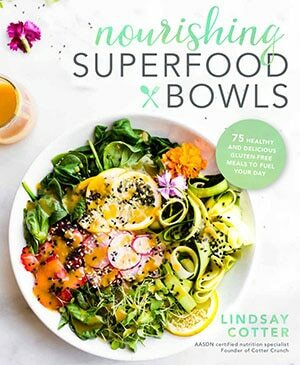 Love this pesto Lindsay! 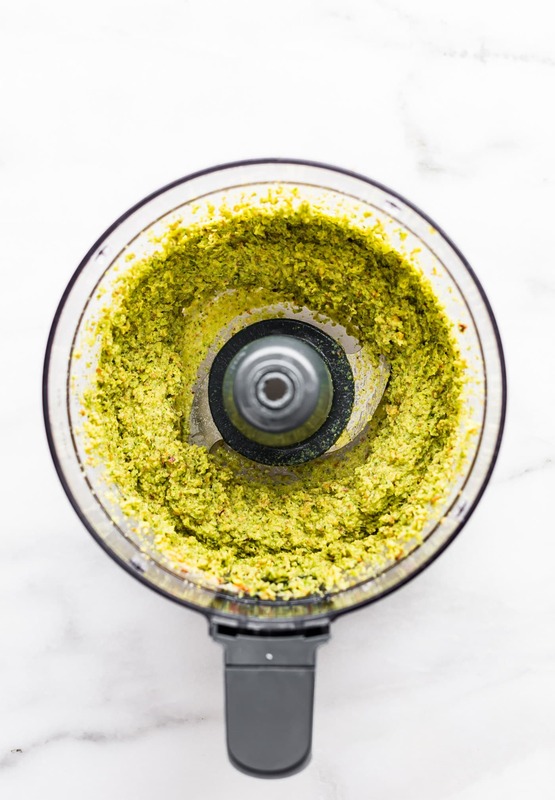 I’ve never tried pesto with broccoli, but I will definitely be giving your recipe a go. Love the addition of the olives and the change up to almonds! So much goodness and packed with flavors, I love this! I <3 pesto so much! 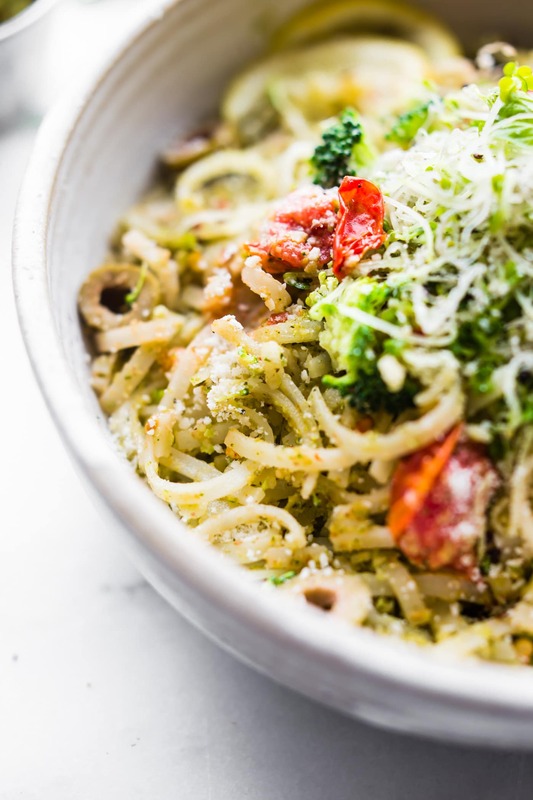 You had me at broccoli pesto!! This salad looks like the perfect way to use this Summer’s produce! Cannot wait to give it a try! Also love that there is a vegan/dairy-free option! OMG – love this story. I can totally relate. I discovered rocket in England while doing a semester abroad there and then came back here looking for it under that name rather than arugula!! This pasta dish – has my name all over it. A handful of my faves in one dish? Yasss. I also LOVE making homemade pesto, but NEVER thought to include broccoli. Gonna have to try for sure! I just asked Vegas if I could start sending her recipes to make me while I can’t walk. This is being sent riiiiiiiight now! I think we should go back to this place and order rocket together. Post surgery? 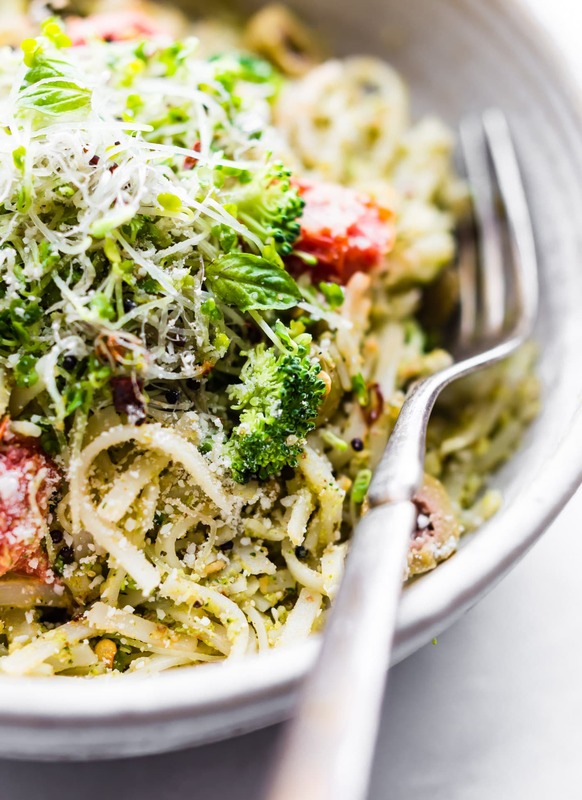 i have never tried broccoli in pesto but you are making me want to try this soo bad! This looks absolutely delicious and I am totally making some version of this tonight! how about I make you chicken and you put it on that? 😉 I would deliver if i could! I would be confused by rocket too lol. Love that you added broccoli here! Quick dishes like this are my jam! Ok you’re blowing my mind here. I love making pesto with ingredients other than basil, but NEVER would have thought to try broccoli. Genius, girl. Can’t wait to make this! Everything about this made me SOOOOO excited for pesto!! I’m totally loving the peppery kick from arugula. We keep at least 1 bag in the fridge at a time! I have never thought to add broccoli to the mix though! So good!! Can’t wait to try this! I love pasta dishes like this! This looks beautiful. Also, today I leaned the phrase ‘rocket’. Funny. This pesto looks out of this world amazing! So much flavor. you know it! i am a pesto lover! This looks delicious!! I did know about rocket, but that’s probably because my husband is English, and I discovered that myself when we went there the first time together haha. I think “rocket” just sounds better than “arugula”! It’s arugula here in Canada too. haha rocket does sound more peppy and fun! I am always game for a bowl of cheesy pasta. I could not love this recipe more. YUM! oh it’s 1/3 cup! I’ll update!! Thanks. You can use 1/4 cup if you want thinner pesto. Yum! I love pasta dishes and I will definitely try yours! 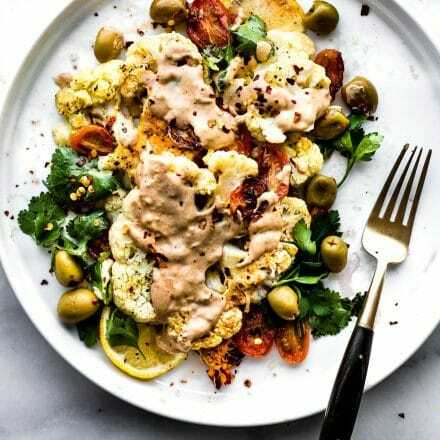 Is this dish better with nutritional yeast or parmesan? oh tough call! I kinda like nutritional yeast better. Looks like an amazing recipe! And I did try saying this recipe name ten times fast! We are always looking for ways to include broccoli in our meals. Thanks for this idea of including it in pesto. BTW, your photos are making me hungry and I just finished my lunch! I want all of this recipe, in my mouth, right now. I’m seriously drooling all over my keyboard as I type. I’m pinning this recipe for later, I’m excited to make this! 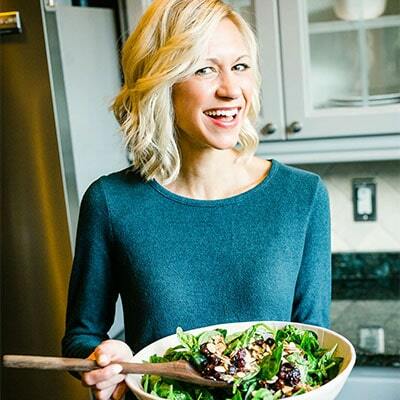 Thank you for sharing your tips on peppery broccoli arugula pesto pasta! This pasta looks absolutely stunning and I love anything with a healthy dose of black pepper! Great post, I so enjoy your site and your recipes. Would you please consider adding a print option so we can enjoy your recipes a little more easily. 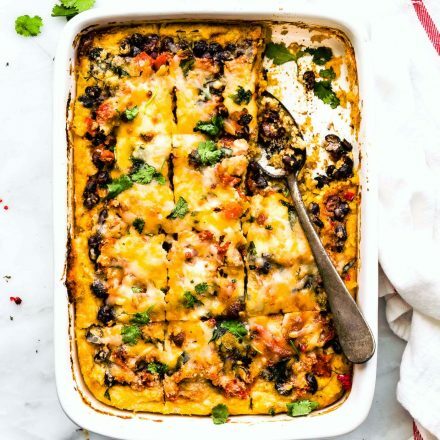 This looks absolutely delicious and I am totally making some version of this tonight! This looks beautiful. Also, today I learned the phrase ‘rocket’. Funny.